I'm a little fuzzy about who introduced me to spice cake. It was either my mother-in-law or my sister-in-law. One great thing about my husband's family is we all share our recipes with one another. Spice cake is delicious...even if a recipe is not required. Last week I bought apple cider at the local apple orchard. I immediately was considering what would compliment the cider for a tasty treat. The previous week I had made Laura Ingalls Wilder's gingerbread recipe. I decided on spice cake and contacted my husband's mom to ask how she makes it. She makes wedding and birthday cakes (including ours) on the side, so she is my go-to for all things cake related. Though she has fabulous cake recipes which she typically uses, I know she uses a cake mix for spice cake. Yep. It's that good...and easy. I emailed asking her what alterations she makes to the mix and how to properly grease my Bundt pan. I tend to struggle with cakes and sweet breads; often a good portion remains in the pan. I knew I didn't want that this time. Any time you have a cake or sweet bread that needs to be removed from the pan, grease and flour the bottom of the pan. Use Crisco. 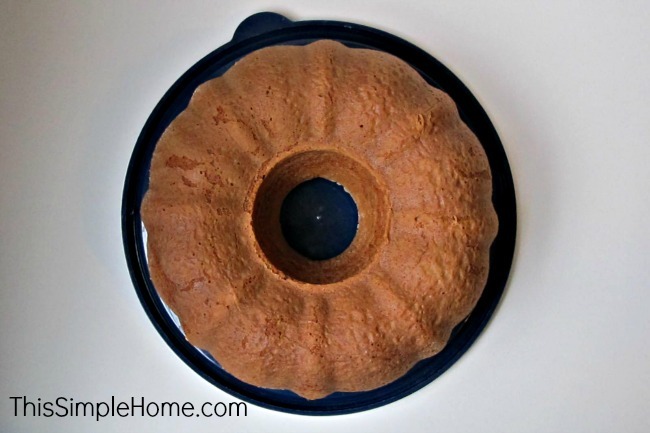 For a Bundt cake pan, grease and flour the bottom and sides. Once again, use Crisco. As you can see, it makes the cake come out from the pan nicely. When I asked my mother-in-law, who is always so helpful, what adjustments she made to the spice cake mix, she said none! I changed that a little. With my Betty Crocker Spice Cake Mix, I added the water and eggs, as suggested, but I substituted homemade applesauce for half of the oil. I thought this would be the perfect recipe to add a little apple and cinnamon flavor, though I don't think it's detected. Once the cake was cooled, I prepared the frosting glaze. I had never needed a thin frosting before. 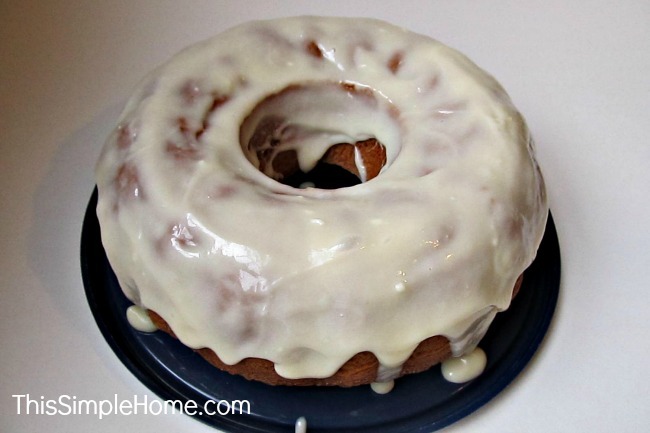 I decided to adjust my cinnamon roll recipe's glaze for the spice cake, since it's delicious. It seemed fairly thick for a drizzle-type frosting, but it complimented the spice cake well. 1. Mix all ingredients together until no lumps remain. 2. Drizzle over the top of the cake. Gravity will pull it down the sides. Please note: Use real vanilla. It's worth it. Now I admit, this picture isn't that pretty, but you didn't taste it. Oh, it's good! Did you notice my cake plate? Yeah, it's not a plate. It's my make-do cake server. What's your favorite cake flavor? Our birthday week is coming up when all three of my children have birthdays. I surprised myself at making this cake since we'll have more then. That's okay though. This is good stuff. 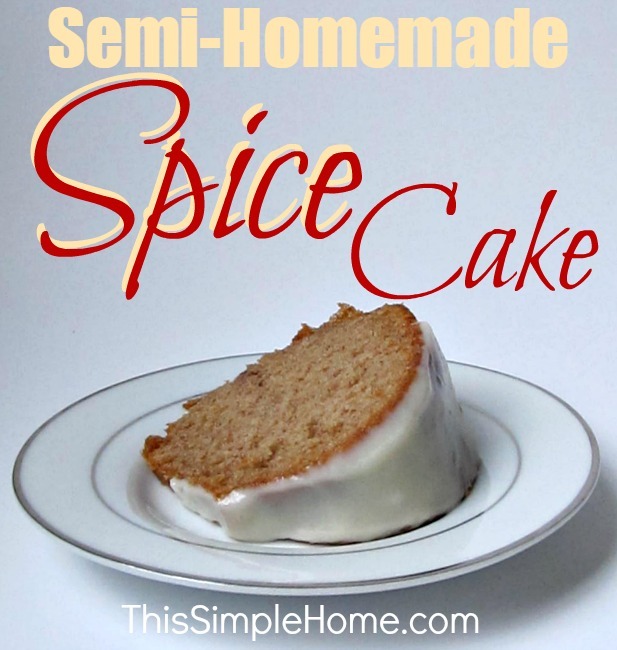 We love spice cake and this one looks delicious Annette. Yummy! I need to make this now. Love a good spice cake! Thank you so much for linking up at Tasty Tuesday! Your recipe has been pinned to the Tasty Tuesday Pinterest board! Please join us again this week!